Royal Doulton began in England during 1815 previously known as Jones, Watts and Doulton. It wasn’t until 1973 that Royal Doulton claimed its current name that people across the world know and love. Royal Doulton boasts some of the most popular collections of tableware and ornaments, adding newly hand crafted pieces yearly. Each year Royal Doulton produce one ornament made of fine bone china that represents the meaning of motherhood for their mother’s day collection. A new concept and angle of motherhood is demonstrated and portrayed in each of these fine bone china masterpieces. 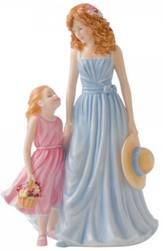 This article will outline the past seven annual mother’s day figurines produced by Royal Doulton. This piece produced for the 2011 mother’s day was designed by Neil Faulkner. Created with shades of ocean blue, white and cream this figurine shows the pure love and connection between mother and baby. The tiny baby lays it’s head on the shoulder of it’s mother who stands 8.7 inches tall. This edition depicts the warmth and comfort children feel from their mother’s arms. This figurine sells for approximately $224 although can be hard to purchase due to the high demand for these figurines. The 2012 mothers day edition by Royal Doulton depicts a mother with her young daughter out perhaps on a sunny day sharing memories together possibly picking the flowers held in the little girls hand. Blue’s and pink’s are the dominant colors within this piece and show the contrast between the young girl and her mother. This piece, hand made and decorated also sells for approximately $224. ‘A Tender Love’ is 8.6 inches tall and was designed by Neil Faulkner. 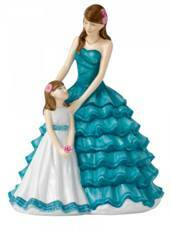 This figurine portrays the beauty of motherhood shown by the glowingly gorgeous mother and daughter. Togetherness, gets its name from a mother and a daughter close by each other picking flowers. 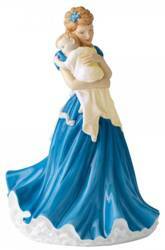 This piece created by Neil Faulkner was the 2013 special mother’s day edition by Royal Doulton. Standing 8 and a half inches tall both the mother and daughter are matching in tones of pink and white. With similar stances, colors and facial expressions this edition shows the pure bond between a mother and her daughter. Togetherness displays femininity as well as motherhood. Made of fine bone china this piece of Royal Doulton history currently sells for approximately $153. Designed by Neil Faulkner a British designer, A Mothers Joy, the 2014 Royal Doulton mother’s day edition is of a mother holding her daughter above her waist. This bone china piece displays a woman sweeping her daughter in her arms both looking into each other’s eyes. The mother’s skirt has a floral pattern and the daughters sleeves delicately cuffed with blue showing the pure attention to detail that Royal Doulton provides. Unlike many of the other mother’s day edition pieces where the child is standing next to the mother, this piece the mother is holding her child adoringly. This piece can sell for up to $320. Time together was produced for the 2015 mother’s day sharing precious moments between a mother and daughter. This fine bone china piece intends to recreate times spent between mother and daughter getting ready for a special occasion. The mother dressed in a vibrant red ball gown is gripped by her daughter who appears to be wearing her floral blue night gown. Each mother’s day piece is hand crafted by Neil Faulkner although this particular piece not only represents mother’s day but also the 200th anniversary of production of Royal Doulton. This piece measures 9 inches tall and can retail for approximately $215. ‘Time Together’ in particular not only represents mothers day but was also inspired by aspects of beauty, dance and fashion. Retailing for approximately $224, the 2016 mother’s day piece titled Cherished Moment is of a daughter who is the spitting image of her mother. Both mother and daughter wear similar pink flowers in their identical brunette hair. The trim on the daughters dress along with the ribbon around her ribs matches the color of the mother’s dress. This ceramic figurine which stands 8 and a half inches tall depicts the similarities between mother and daughter and shows the way in which many young girls look up to their mothers and aspire to be like them one day. 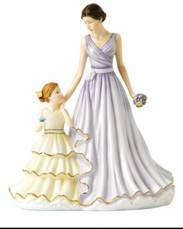 Royal Doulton in this special mother’s day figurine has intended to present that every young girls role model is their mother. Cherished Moment is the second newest mother’s day figurine to date. Precious moments, the 2017 special mother’s day piece by Royal Doulton stands 8.7 inches tall and retails for approximately $250. Both mother and daughter wear ball gowns with gold trimming. The daughter looks up to her mother while the mother looks down upon the daughter. The young daughter has a blue butterfly resting on her hand while the mother holds a bunch of flowers. Fine details have also been incorporated into this piece such as the fine pearl necklace visible on the mother neck. This piece has been created from fine bone china and is the most recent mothers day edition to date. If you are looking for a special gift for your mother this mothers day look no further than the Royal Doulton special bone china pieces. Each mother’s day edition, is a unique hand crafted ornament with its own special meaning. These unique pieces are a gift that will last with care, longer than a lifetime.